The New Yorker ran a great article by John Cassidy last week, discussing what it means to be "poor" in a nation as prosperous as America. The upshot: Cassidy recommends that the US replace the official poverty line -- first adopted in 1969 and adjusted for inflation ever since -- with a "relative" income standard that tracks how many people earn less than half the median income. I think he makes an interesting case, and some important points. As should be obvious, poverty is a surprisingly difficult concept to pin down. The official US poverty line -- the level of income that separates "poor" from "non-poor" -- is pretty arbitrary; it's more a quirk of history than a useful distinction in the real world. Arguably, the poverty line could be higher (on the grounds that it's pretty chintzy) or lower (on the grounds that poor people in America might be relatively well-off in some countries). It's also inflexible: the poverty line is fixed all across the country, no matter what the local cost of living is. It's bad enough being below the poverty line in, say, rural Oregon; but living in Manhattan below the poverty line might leave you with no money for anything besides rent, if that. And the official poverty line only looks at pre-tax income, so it doesn't consider tax payments, nor at some forms of income (such as Earned Income Tax Credits). Just as vexing is the fact that the economy keeps changing in ways that the poverty measure can't account for. Food, for example, is much cheaper than it used to be, relative to our incomes; and consumer goods are cheaper still. So a poverty wage will buy a lot more food and, say, stereos than it used to. But the cost of medical care and, in some places, housing have gone up faster than inflation -- both for structural reasons, and because (for medical care, at least) the quality has improved. These things don't matter so much year-to-year; short-term changes in the poverty rate usually provide a pretty good gauge of how people at the bottom of the earnings ladder are faring. But long-term trends in poverty rates are less meaningful. It's hard to compare how "poor" someone at the poverty line is in 2006 with how "poor" a comparable person might have been in 1980, or 1970. This isn't to suggest that US poverty now is any better or worse than it used to be -- just that it's different. But the poverty line doesn't register those differences. I'm not ready to abandon the US poverty line quite yet. But it would be useful if the US Census bureau were to track income inequality more rigorously, and report on it as widely as they report on the poverty rate. That way we'd get information about both absolute and relative deprivation -- and a fuller picture of a set of trends that deserve way more attention than they typically get. How much of a pay cut would you be willing to accept to take a more satisfying job? Increased trust in your employer is worth a 36 percent pay raise. A greater variety of projects is worth a 21 percent pay hike. Having a position that requires skill worth 19 percent more pay. Having enough time to finish your work is worth 11 percent more pay. Based on this, then, you'd be happier overall taking a 20 percent pay cut to work at a place where you trust your employers more; but you're better off in sticking with a somewhat harried job than taking that same pay cut to work at a more measured pace. Of course, this somewhat contradicts this earlier post on a study that found, among other things, that working on a job where there's pressure to work quickly is just about the least satisfying thing you can do with your time. It's also worth noting that increased pay doesn't do all that much for your happiness: a pay raise of $100,000 only begins to approach the wellbeing people typically derive from a stable marriage. This suggests that a slightly slower pace of work probably only does a little bit for your wellbeing. Still, every little bit helps. Rails to Trails to Economic Development? I have a dream, and last year’s “official opening” of the One Spot Trail here in the Vancouver Island’s Comox Valley is part of its realization. The “developed” part of the trail is about 6 kilometres long. It’s a multi-use trail for walkers, cyclists, and horseback riding that parallels Condensory Road for part of its length, making a pleasant diversion through standing second- growth timber, then “ending” where the railway trestle used to cross the Tsolum River. Someday it’ll cross the river and head north. I use quotation marks because the One-Spot Trail follows an existing railway right of way (RoW) that still stretches from the old log dump south of Courtenay, well into the Sayward Forest 120 or so kilometres north. Some stretches of the old Comox Logging RoW are still visible and in use as civic parkings, alley-ways, or urban walkways. Rural remnants are still walkable in some of the rural hamlets north and south of the city. But most of it is “lost,” buried in backyards or plowed into farmers’ fields, or hidden in the now twice logged-over lands that lie behind the settled strip of land on the east side of Vancouver Island. There is a happy irony in naming this throughway the One-Spot Trail. The old One-Spot, a wood-burning locomotive, once pulled millions of dollars of timber out of this region. That was yesterday’s version of “rural economic development.” Today, the railway grade offers another type. The irony deepens. The undeveloped part of the trail, as a relatively “protected” strip of land running through the heart of one of the world’s great forest ecosystems, is today--in places--one of the few places within walking distance of Courtenay where it’s possible to go for a long walk in a big Douglas fir forest. We are slow on the uptake hereabouts. Maybe it’s living in the lap of so much natural wealth. It’s a commonplace, but three generations ago many people still believed that we’d never run out of first- growth forest. The wealth of timber seemed inexhaustible, and the wealth of work in the woods seemed unending. Now, relatively few people appreciate just how valuable our second-growth forests are becoming. Not in terms of timber, but as places where locals and tourists can get a sense of the former abundance of this place. It’s an aesthetic-spiritual experience, one that more and more people are valuing, as tourists, and as residents. Living with so much natural wealth, it’s easy to take it for granted. Even to downplay what we have as “only second growth,” a pale shadow of the much vaunted “ancient forest.” For many around the world our wealth is plain to see: clean air and water, great swaths of unpaved and undeveloped lands, an amazingly resilient forest, a hospitable and temperate climate. Even our still relatively small settlements have some charm left to them (though our land use planning and development practices are an example of how little we regard the qualities of “charm” or “aesthetic” experience when it comes to built forms, housing). People who visit want to come back. And they want to deepen their experience of the things we take for granted. Like a walk in the woods. It’s hard to know how much of an impact a trail can have on a scattering of rural hamlets. But, as tourists look for more active and “natural” ways to experience places, trails--and services for walkers and cyclists generally--start to look like a good and relatively inexpensive infrastructure investment. About a dozen years ago bicycle touring started to emerge as a tourist activity on the Island’s Saanich peninsula. That area is laced with secondary roads and byways, has a rural agricultural feel, and links with ferries to Duncan and the Gulf Islands. The impression was that these were “cheap” or “budget” tourists. The reality was that they were spending over $100/day on accommodations, meals, and incidentals. Analysis showed that these cheap tourists were worth over a million dollars annually in the area. Extraction is how we used to do rural economic development. Douglas firs. Salmon. Coal. Currently, we’re extracting raw land for large lot subdivisions. The challenge is do a different kind of “extraction,” to get as much “use” out of our landscape, forests, beaches, mountains, clean air and water, etc without diminishing its ability to sustain the high quality of life of those of us lucky enough to call this place home. The dream of an extensive Comox Logging RoW trail is only part of the picture. In the backyards and backwoods of every Island community are hidden old railway grades. The Comox Logging RoW crosses several, including the Elk River right-of-way that connected Campbell River to the Quinsam River and Campbell Lakes valleys, the Bloedel Steward and Welch networks heading inland from Menzies Bay, the Rock Bay and Kelsey Bay rail lines that snaked into the White and Salmon River valleys, and so on. To begin the work of mapping these connections, and then creating partnerships and low-key development may begin generating jobs and businesses in the rural communities that haven’t done well with the passing of yesteryear’s timber bonanza. The One Spot Trail is only 6 kilometres long at this point, but it’s a great start. Meanwhile, I’m still dreaming. There’s a walk I want to do. From Royston to Sayward. About 130km. With a stop or two at a B&B along the way, at a pub (or two) for a beer. Maybe I’ll even do part of it on horseback. What a way to spend a week on Vancouver Island! P.S. There is a growing body of research and literature on the economic benefits of trail systems for rural communities. A good place to start is the American Trails website. Interesting column in the Washington Post today. The piece is far too short for the subject--that the economy is darned hard to understand right now--but it's a decent primer. There is also a plethora of data sets that can be used to show that, in reality, we're all still better off than we were 10, 20 or 30 years ago, or, if you wish, that the American Dream is dead and the economy is now run by and for the super-rich. What is almost certain, however, is that fundamental changes in the structure of the labor, product and capital markets are accelerating a long-term trend toward income inequality. ...a college degree has hardly been a ticket to big income gains. The 2006 Economic Report of the President tells us that the real earnings of college graduates actually fell more than 5 percent between 2000 and 2004. Over the longer stretch from 1975 to 2004 the average earnings of college graduates rose, but by less than 1 percent per year. The Economic Policy Institute makes the same point on their website: "Since 2000, the real earnings of college-educated workers (those with bachelor's degrees) have fallen quite steeply..." So having a degree doesn't guarantee that you'll grab a big slice of income pie. But who is capturing all the wealth? In other words, not only are the ultra-rich getting richer, but they're getting richer much, much faster than the plain old rich. And even if you count yourself among the fortunate few who earn more than 90 percent of American households, your gains (as a class) have been very slow. And the picture looks even bleaker for young workers. Income fell 8 percent, adjusted for inflation, for those under 35 and 9 percent for those aged 35 to 44. The median income for men under age 44 was significantly lower in 1997 than in 1970, after adjusting for inflation, according to a long-term analysis by the Census Bureau in the late 1990s. For those over 45, incomes barely held their own during that period. The entry of women into the workforce in those decades has helped push median family incomes up over time. But even when men and women are included together, younger workers (age 25-34) are earning well below what they did in 1970. And at all ages, evidence suggests that families are putting in more hours of work to make their household incomes rise. Add to these financial stresses the skyrocketing cost of healthcare, education, and housing (no, it's not really cheaper today) and you have a recipe for a rather unhealthy looking economy. What's most astonishing to me, however, is how little play these stories get in the media. Business page-dominating stats like GDP and the Dow simply don't tell us very much about the economy--or at least about how the economy actually affects people. It will be interesting to see which gets more media attention: the increasingly fragile income dynamics for ordinary Americans or the 2005 GDP numbers that the feds are just about to release. I'll go out on a limb and guess it's gonna be GDP. No point summarizing here. If you're interested in the relationship between economic growth and personal happiness (an area we've written quite a bit about), just go read this post at Angry Bear. Just in time for the release of new GDP numbers at the end of this month, Alan Durning has penned a piece on why these figures are as bogus as Enron's balance sheets--and a new program to dethrone GDP once and for all. Read the full piece on Tidepool.org, NEW's online news service. Estimated twelve times a year by the U.S. Department of Commerce's Bureau of Economic Analysis (BEA), GDP is not a profit-and-loss statement for the nation, as many assume. It is a tally of finished goods and services. GDP math counts all spending as good, whether it's on weddings or divorces, college tuition or Botox injections, prenatal care or cyberporn. Consequently, everyone from President Richard Nixon to Nobel Prize-winning economist Simon Kuznets (who helped devise it in the 1930s), has denounced the GDP (and its sibling, GNP) as a measure of progress. Still, the public, led on by the media, continues to treat BEA's GDP figures as society's report card -- and we've organized our national economy to get "A's." GDP announcements send waves through the nation, nudging investment decisions, changing interest rates, and making or breaking political careers. To improve GDP accounting, the National Research Council panel, chaired by Katharine Abraham of the University of Maryland, proposed that BEA build a set of "satellite accounts" that assign a dollar value to such unpaid activities as housework, studying, and parenting. They also propose that satellite accounts subtract from GDP some of the environmental costs of production. These outrigger accounts would put the main financial accounts into perspective as never before. For one thing, the satellite accounts would be huge. One study estimated that Australians produce goods and services in their own homes for their own consumption -- by cooking, cleaning, doing repairs and yard work -- worth nearly half as much as GDP. And housework is just one of five new accounts the Abraham panel proposes! City housing is unaffordable. It's cheaper to buy a house in the suburbs, where you can get more for your money. Right? Not so much, according to a new study from the Brookings Institute, "The Affordability Index," which challenges the conventional wisdom by arguing that the best way to assess affordability is with reference to the costs of both the home and the transportation necessitated by the home's location. 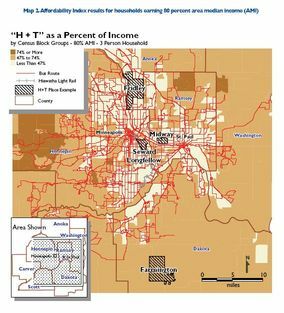 In an analysis of the Minneapolis-St. Paul metropolitan region, it turns out that the suburbs aren't nearly as affordable as they first appear; nor are city neighborhoods nearly as pricey. 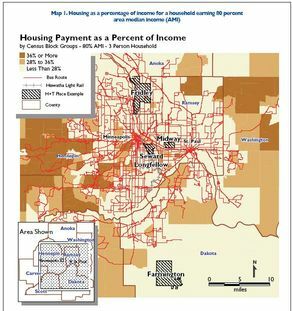 That's largely because suburban residents must spend more on cars ownership and use--they have, on average, 2.1 cars per household--while in-city residents can rely on cheaper forms of transport--they own only 1.2 cars per household. Even when in-city transit is factored in, a city resident spends less than half as much on transportation as a resident of far-flung suburb. That's real money--roughly $500 per month--that can make a big difference when it comes to affording a house. But in deciding where to buy (or rent, for that matter), few of us assess the transportation-related costs, a factor which surely contributes to buyers choosing far flung developments. If planners can devise ways to apprise buyers (and renters) of the true costs of their housing choices, it would likely encourage residential density and mixed-use zoning. Because living near good transit service and within a short walk of services isn't just eco-groovy--it's smart financial planning. What's The Best Thing Since Sliced Bread? SEIU just announced the winners of "Since Sliced Bread," their contest where ordinary folks propose ideas to improve economic conditions. Some of the ideas are pretty intriguing--take a read. As it turns out, the answers actually do not include sliced pickles or beer in a can. Darn it. I'm a couple of days late on this, but it's still worth mentioning the new 2006 "Pulling Apart" report that's just out. Even if you're not a data-geek, it's worth a glance, as it's easily the single best source for income inequality trends in each of the 50 states. Not dying to read it yet? On average, nationally, the incomes of the poorest fifth of families grew by $2,660 over the two decade period [early 1980s to early 2000s], after adjusting for inflation. By contrast, the incomes of the richest fifth of families grew by almost that much ($2,148) each year over the course of two decades, for a total increase of $45,100. You can find out how your state fared. And you can find out which Northwest state ranked 3rd in the nation for the greatest increase between the wealthy and the middle class. But you'll have to read the report for yourself--the full version and state-specific fact sheets are here. The report is subtitled, "A State-by-State Analysis of Income Trends," which pretty much says it all (though perhaps not in the most sparkling language imaginable). It's researched and written by economists at the Economic Policy Institute and the Center on Budget and Policy Priorities.